Olive was the daughter of Sir Henry Sharington and Anne Paget. By reputation a redoubtable woman, she was twice married. The first time to John Talbot, who she married in 1574. He passed away in 1581 and she then married her second husband, Sir Robert Stapilton in 1584. She outlasted him as well, when Sir Robert died in 1606. The marriage to John Talbot resulted in one child, Sharington Talbot, but he died before his mother in 1642. Somewhat luckily, he had married (twice) and produced an heir, also named Sharington Talbot, who inherited Lacock on his grandmother's death in 1646. Traditionally thought to be of Olive Sharington, as written on the painting. 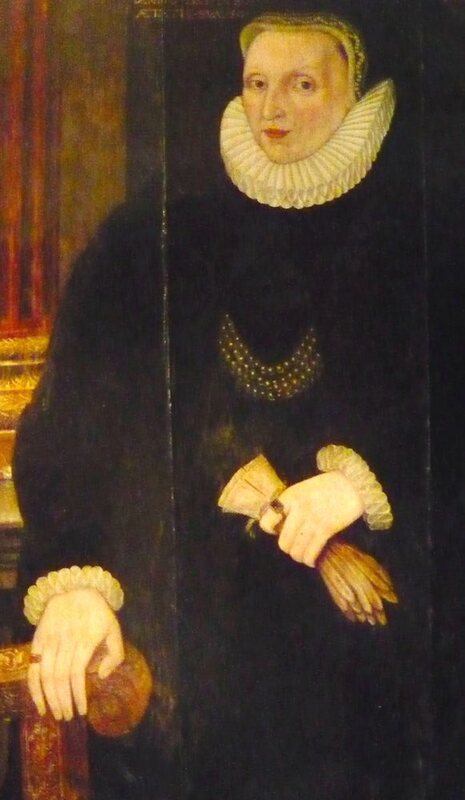 National Trust experts now think this may be Grace Paget, 3rd wife of Sir William Sharington.